There is no fee to attend the Fair but the Workshops are $5 each or $20 for an unlimited pass (per person) and can be purchased at the entrance / registration table on the day of the event. The Story of My Front Yard Garden - Even the tiniest space can be designed to be beautiful, sustainable, and highly productive. In this workshop, Jon tells the story of how he turned his front yard into a wonderful garden. 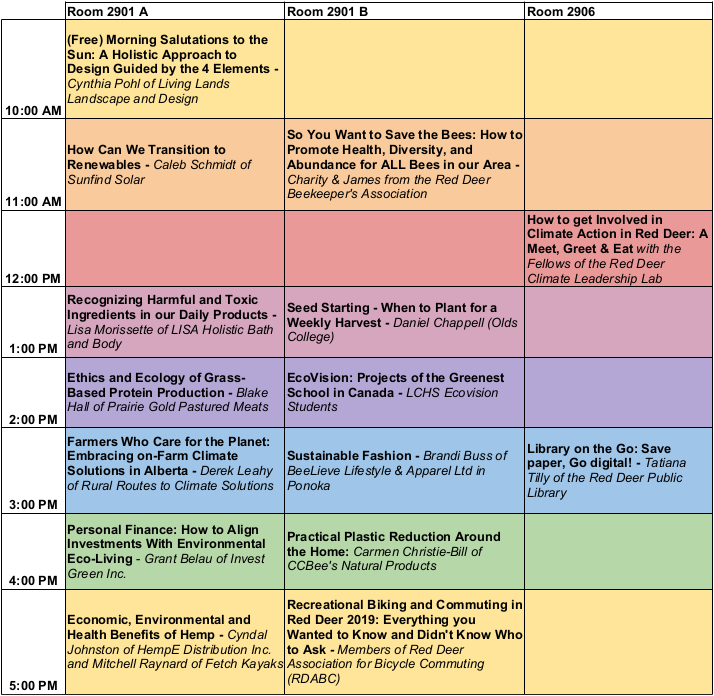 He will talk about what he has learned about composting, seed saving, and ways to make your home more sustainable! Top Bar Hive Beekeeping - There are many ways to keep bees, each with its own particular tips and tricks. Charity has been beekeeping in a top bar hive since 2013 and has enjoyed the process of what many consider a more "natural" system. She will demonstrate some of the particulars and share some tips for success for others who may be interested in this method of beekeeping. Creating a Safe Sustainable Haven - In this workshop, you can learn how to create a more sustainable, chemical-free environment for your family and our planet. By making small, conscious choices, collectively we can work together to lessen the impact on our planet and leave a lasting positive legacy for future generations. Learn how to improve quality of life by radically reducing chemicals in your home! Is a Solar Energy System Feasible? - Ever wonder if a solar energy system can generate adequate energy in Alberta, or if there are any financial benefits to installing a solar system? Come find out what's required and what you need to know for a successful installation! Attracting Bees & Butterflies to Your Garden - In thinking of the future, we need to keep our pollinators to have successful vegetable gardens and crops. In this workshop, Christine will show you different perennials and annuals that will compliment your vegetable garden and improve your living space! DIY at Home with Essential Oils - Learn about the benefits of essential oils, safe usage guidelines, and how essential oils, when combined with other common household ingredients, can replace toxic staples in the cleaning cupboard, leaving the home and the environment healthier. You will also have the opportunity to make a product of your own to take home! Rainwater Harvesting - In this workshop, Andrea will share practical tips that every homeowner can use! She will walk you through the design of a rainwater harvesting system for an urban lot and home. Using existing design, you'll review all the parts of the system, as well as review the costs involved. Whether you want a simple rain barrel or a more complicated system, this workshop has something for everyone! 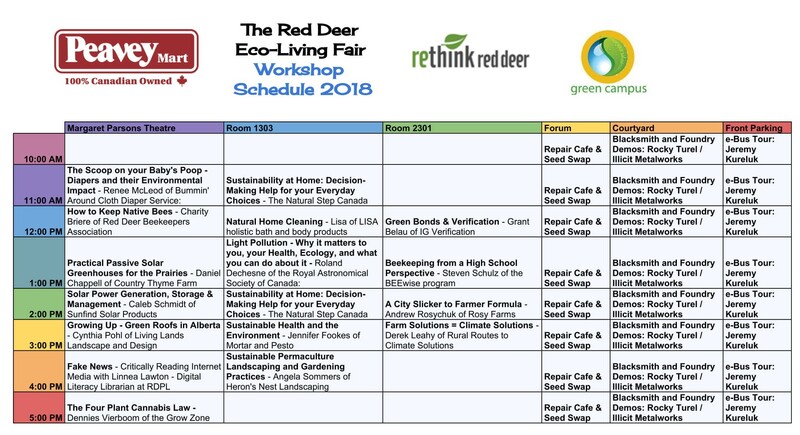 Sustainable School Projects from a Student's Perspective - This workshop highlights many of the green school projects from Lacombe Composite High School such as BEE WISE, pollinator gardens, aquaponics, and the Little Green Thumbs Earthbox gardens. Participants will be encouraged to think of ways they can support local school and community projects by volunteering, giving advice, or providing resources. Students will also have samples of their produce! Sweet Dreams - Stella will share how her determination for a better life for herself and her family inspired her to recreate a new one using the resources she had. She will show you how to create your own natural perfume while helping you stay focused in creating the vision you see for yourself and your life. In this workshop, you will blend your own unique scent and dream out loud! Passive House Fundamentals - Passive House buildings achieve a high level of indoor air quality and obtain substantial reduction in space heating requirements compared to the standard building practice in Alberta. This presentation is aimed at all those with an interest in low energy design and construction and it will provide participants with the concepts, challenges, and recent developments for high performance design and construction for the local conditions. Preservation - Come learn how easy it is to preserve your garden bounty for the winter! This workshop will be a hands-on audience participation jam-making session. There will also be a discussion on how to pickle and make cooked jam. Of course, the workshop ends with a taste test of homemade jam! Intro to Fermentation - Fermenting food and beverages has been part of human history for thousands of years and for many of those years, the primary means of food preservation. What we haven't realized until more recent times, was that naturally fermented foods are integral to a healthy immune system and as an important systemic anti-inflammatory. In this workshop, you will explore the basics of fermentation to understand how safe, easy, and inexpensive they are to produce at home for a boost of live beneficial probiotics. Learn more about kombucha, sauerkraut, and more! Holistic Farm Design - Grounded in the principles of permaculture design and holistic management, this workshop will identify the four ecosystem processes present on all farms and provide some tools to help landowners harness nature's productive potential. Come learn how to design for healthier land, more prosperity, and the time to enjoy it! Holistic Home Design & Renovation - This workshop is all about making a home resilient, adaptable, and healthy. It will help those who are thinking of building or renovating their home in applying sustainability principles to their project. Learn how inhabitants can maximize a home's resilience, adaptability, and their own well-being by considering the "house as a system" and keeping sustainability in mind. This approach can address immediate concerns related to budget, energy efficiency, health, and other factors, as well as meet the changing needs of the inhabitants for the future! The workshop provides a roadmap to making home improvements or building from scratch, while considering different future scenarios influenced by cost, climate, and the occupant behaviours within the home. Seed Saving Basics - Learn the nuts and bolts of small scale seed saving for your own backyard! In the home-gardener focused workshop, horticulturalist Daniel will show you what you need to do to save your own vegetable seeds year to year! He will cover how growing vegetables for seed differs from growing to eat, how to maintain seed purity, and collection methods. Ecological Landscaping: Designing for Yourself + Beyond - Landscape design is an art that ideally works with nature, supporting all organisms that live on and in the land. Building healthy relationships between all communities, plant, animal, insect, and human is an important component in creating a healthy landscape. Learn about how to design a landscape that fulfills your needs as well as the local birds and bees! Starting Seeds Indoors - Ever wonder when to start your seeds inside, and the best way to do so? This workshop will cover the basics of starting seeds indoors in Alberta and having success. Denise will review what you need to know to get started. From the importance of understanding your local hardiness zone, to the quality of seeds & materials, you'll learn the process involved to set yourself up for a successful growing season. Praise the Lard! - This non-denominational workshop covers how to welcome lard back into your life. Come find out how new science is validating your Grandmother's secret ingredient. It will cover the "how-to's" of rendering and use of lard in everything from pie to polish. You will also get a chance to try out some samples of the lard based body butters, lip chaps, and beard rubs. Fruit Trees on the Prairies - Fruit on the prairies is everyone's dream. In this workshop, you'll talk about the dream and the reality. Learn what we can grow locally in terms of apples, plums, pears, and cherries. Sherwood will review different options for bush fruit. How much work is it, and what are the downsides? Learn how you can site trees to optimize your chances of success!